Since January 2017 Cornell Cooperative Extension of Sullivan County (CCE) has been offering a "Cooking with Cornell" class as part of Fallsburg Jr/Sr High School After School Program. Meeting once a week, CCE Healthy Schools Program Coordinator SueAnn Boyd has been the main instructor. The program is part of a Fallsburg CSD grant with CCE as a partner. Partnership is exactly the right word for the working relationship between the school and the agency. Ms. Boyd has been a very active member of FCSD Wellness Committee for the past several years. CCE has participated in every Wellness Day Event and Healthy Snacks Day in the District. As FCSD Director of the After School Grant Program and Chair of the Wellness Committee Suzanne Lendzian is grateful for SueAnn and her staff from CCE, Bee Moser and Bridget Kackos. 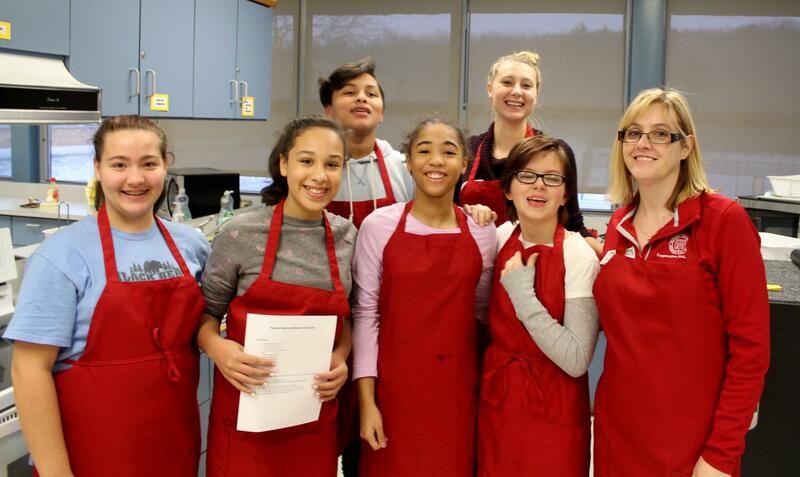 Just before Christmas in 2018, SueAnn and Bridget met with nine eager 7th and 8th graders in the Home and Careers Kitchen at FHS to bake some special sugar cookies and peanut butter blossom cookies to bring home to their families. When asked about cooking with SueAnn and her staff, the students were delighted. They emphasized the different foods that they never heard of, much less tasted, before this class experience. They enjoyed pasta made from spaghetti squash! Some has not ever eaten eggplant, and now they enjoy it. They cannot wait to share the food and help with shopping and cooking at home. This is an important part of CCE's mission.